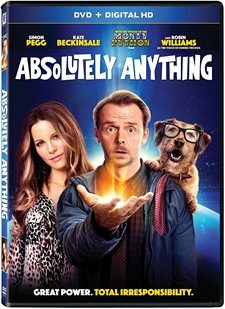 Download Absolutely Anything in Digital HD from the iTunes store. 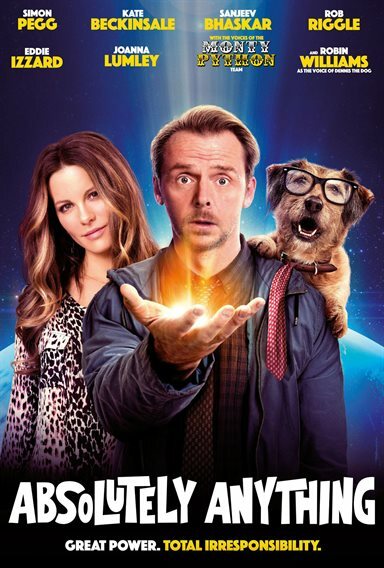 Absolutely Anything images are © 20th Century Fox. All Rights Reserved. Robin Williams (Good Morning Vietnam) was a comedic genius who left us all too soon. He was truly one of a kind. He could famously go off on a tangent and make almost anything funny. You couldn't help but smile and laugh when you saw his standup routines and he made a name for himself in major motion pictures even winning an Oscar for best supporting actor in 1998. Interestingly, his last film role didn't even have him on screen but as the voice of a dog, Dennis, in Terry Jones' Absolutely Anything. Even as a dog though, he could still entertain like nobody else. Neil (Simon Pegg; Star Trek Beyond) is your typical, adult, male loser. He has a job he hates, he lives alone and he fantasizes about writing the next great novel and dating his neighbor, Catherine (Kate Beckinsale; Underworld). He lives alone with his dog Dennis (Williams) and has few friends. His boss hates him. He has a boring life that is going nowhere fast. However, when a council of aliens (made up of the very talented voices of the members of Monty Python) decides they may annihilate Earth they give the planet a test. They pick one person to have the power to do "absolutely anything" to see if they will use it for good or evil…and of course, that person is Neil. While Neil is freaked out about his new found power he doesn't do much more than parlor tricks that causes more harm than good. Unaware that his time is limited, Neil ultimately gives the power over to Dennis the dog. Dennis then does the smartest thing of all and unintentionally saves Earth in the process. With a terrific cast and one of the Monty Python writers penning the script, I had hopes for something really fun. Unfortunately, I got mildly entertaining fare for an hour and a half. I really like Simon Pegg and for the most part, he does what he does best. He has a sort of smart goofy quality to him that translates very well into Neil. Beckinsale was actually a little bit of a surprise to me and I enjoyed her in this role. She isn't as dark and serious as I'm used to seeing her (probably because it's a comedy). And, of course, there is no one better that Robin Williams and he was the perfect choice to play Dennis the Dog. The Monty Python team also added another element to the film. The powerhouse cast couldn't save this movie though and it ends up being a little funny in a not so great way. It does, however, make one think about what they would do if they had that kind of awesome power. If you had that chance…what would you wish for? It does bring a little bit of reality to the idea at the end when Neil reveals the incredible pressure having the power causes reminding us once again to "be careful what you wish for". The feature is available in a DVD/ Digital HD combo pack and the disc offers no extras besides the theatrical trailer. However, If you are looking for a silly way to spend 90 minutes, pick this up, if for no other reason that the cast and Williams as a dog.